There’s been quite some discussion in swimming circles about the so called “Japanese Start”, also known as the “GS1”, since UK swimming magazine ran a piece on it in their February 2005 issue. Then a document outlining the purported benefits and how to perform the manoeuvre began to circulate on the internet. But is it the real thing or just a hoax? we decided to look beyond the 1970’s style photo’s and to try and get to the bottom of the matter. The principle is very straightforward, harking back to the arm swing starts of the 60’s, and having something in common with the relay takeovers often seen at international level, in particular by US relay teams. In simple terms, you start as though you are going to do a conventional grab start but hold one arm up behind you, as shown in the photos. The other arm grips the front of the block as in a conventional grab start (from where the GS1 name derives). 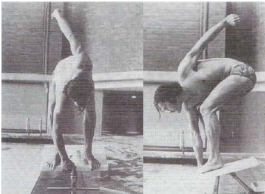 On the starting signal the raised arm is swung down to generate forward momentum, as the swimmer executes a conventional start with the rest of the body. The hands then come together in mid-air ready for a streamlined entry. Sounds good, but enough of the theory, how does it work in practice? As a grab start exponent myself I found that it slowed me down and reduced the leg drive I was able to generate as my weight was moving by the time I tried to push off the block. It might have been more effective with a track start position, but only having one hand on the block will reduce the forward pull that can be generated on the gun. Others may find it better so it’s worth having a play with, but it is unlikely to prove beneficial in competition. So is the start really big in Japan at all then? None of pullbuoy’s contacts, including a former Japanese national squad member, had come across the start, either recently or in the past. Tellingly, at last month’s Japanese World Championship trials, the GS1 was not in evidence, with competitors, including double Olympic Champion Kosuke Kitajima, opting for the more conventional two handed start, be it in a grab or track style. However, that’s not to say it isn’t around in the land of the rising sun; “Tokyo University is one of the best swimming universities in Japan, and they might be researching the start” our source speculates. In summary then, maybe it is a hoax and maybe it isn’t. The principle is sound, but it is not an easy thing to do well and overall is probably slower than more conventional methods. It’s unlikely to be prominent at this year’s world championships, but maybe it will be the big thing in Beijing. The jury stays out! Editor’s note: It’s a hoax! Look more closely at the photo accompanying the article and you’ll see it’s David Wilkie – he and his coach had a bit of fun in the 1970’s and the story resurfaced in recent years.